Anyone can learn to meditate as it is a fairly simple process but it is the discipline of daily meditation that is not easy! Here are some pointers and instructions to help you get started if you have never meditated before. It is good to become familiar with these things before going to the meditations page and selecting your fist meditation. Have a friendly attitude toward learning to meditate. Rather than making it another “to do” on your long list, choose to meditate because you desire to connect to God through your spirit. Do not bring judgement into your meditation as to whether or not you are doing it just right. And let all your striving go… just show up and be still. Where: Do everything possible, to have a place in your home that is set aside for you to have solitude and silence. Above is a photo of my window seat at home. 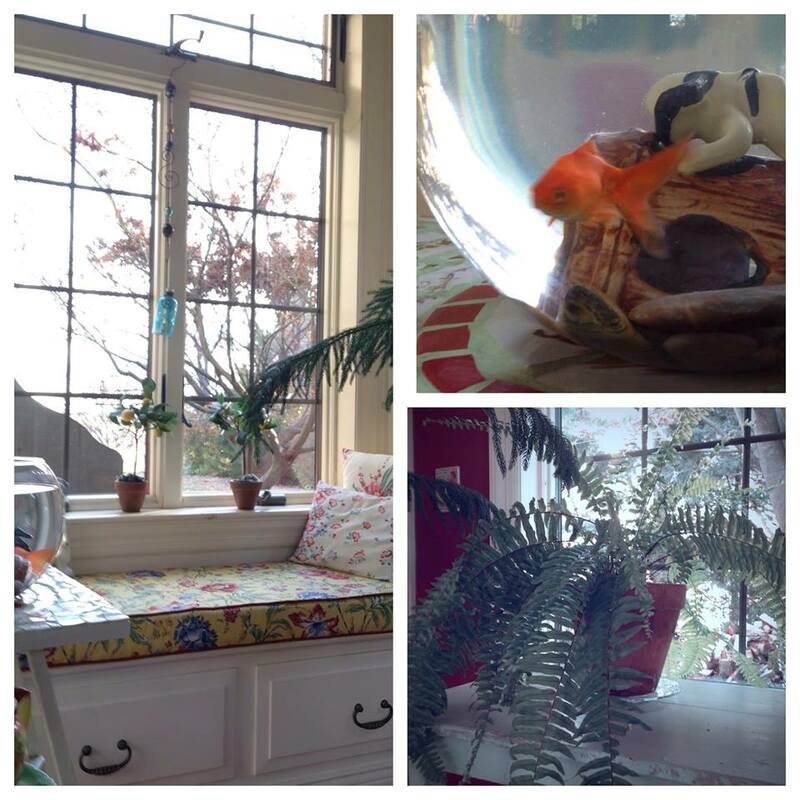 It is one of the places where I like to sit and my goldfish and plants are close by. Your “spot” can be anywhere in your home but put something there to make it special for you. If you are meditating after your yoga practice then you may just remain on your mat. If you are doing your daily meditation separately from your yoga workout, then you may sit comfortably in a chair or on the floor. If you are sitting on the floor you may want to sit on a cushion or folded blanket. It’s OK to give yourself permission to have a sacred place that is just for you, where you will not be bothered. This is a good example to your family, demonstrating that finding inner peace and calm is important to everyone’s overall physical and spiritual health. I would encourage you to teach this to your children while they are young. How: Don’t fuss too much with how you are sitting although you do want to sit with the best posture that you are able to. Engage the muscles in your core to hold you upright and let all other muscles in your body relax. Especially relax your face, neck and shoulders. Now, close your eyes and take your attention to your breath. Breathe in through your nose drawing your breath deep into your belly and then up into your chest. After your lungs are completely full of air, begin a slow, controlled exhale. By breathing out slowly it will help your body to relax more. Keep repeating this relaxing slow breath. Now comes the most difficult part - allowing your mind a rest from all of its daily, continuous chatter. Clear your mind of worry, thoughts and “to do” lists.. Give yourself permission to “just” sit in silence with no thoughts. It is not an easy thing to do but over time with practice it will begin to come more easily to you. If thoughts continue to come to mind, gently send them off like passing clouds and keep returning your attention to your mindful breath. Practice this slow breath and sit with a clear mind, begin your practice with just two or three minutes. Once you know where you will meditate each day and you know how to sit and do the basic breathing, you are ready to choose one of the meditations from the Yoga Bird meditations page. Do your very best to not think other thoughts but just listen to the meditation that I will be sharing with you. You may select a meditation by length or by subject. If you find one that particularly speaks to you, listen to it for several days so that it become a part of the fabric of your soul. I pray that this practice of meditating will relieve stress and help you to relax. I pray that the inner mindfulness that you will master will help you to savor life, change habits, to live more simply and slowly and to be present in everything that you do. Most importantly I pray that once you get your body and mind to sit quietly, that you will be able to listen with your spirit and to hear the voice of God speaking to you. Jesus frequently went away to find solitude and silence so that He could listen and commune with his Father. May Love be with you, as you practice. Your instructions on how to meditate are in line with Centering Prayer, a contemplative spiritual practice that was a part of being with God that the early Christian mystics incorporated in theirdaily life. I find the way that you present the practice of Yoga so “freeing” and love how I can marry a physical practice of well being with a spritual practice!